Product prices and availability are accurate as of 2019-04-14 23:15:34 EDT and are subject to change. Any price and availability information displayed on http://www.amazon.com/ at the time of purchase will apply to the purchase of this product. 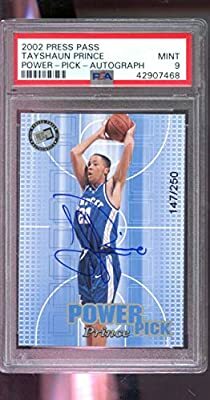 2002-03 Press Pass Power Pick Tayshaun Prince Kentucky 147/250 ROOKIE RC Signed AUTO Autograph MINT PSA 9 Graded NBA Basketball Card. 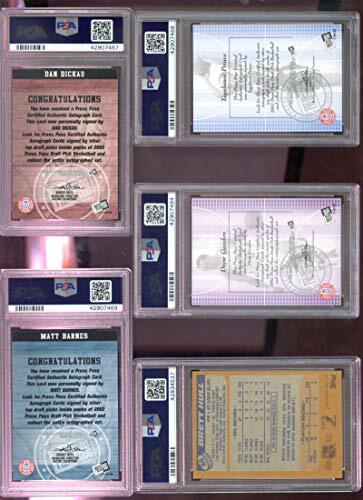 This listing is for a 2002-03 Press Pass Matt Barnes UCLA ROOKIE RC SIGNED autograph Card Graded Basketball Card graded by PSA as a PSA MINT 9. This card comes from a certified autograph issue such that the hand signed autograph is guaranteed to be authentic. The manufacturerand#39;s authenticity of the autograph is described on the card. This is confirmed by the PSA authenticating the card. The back of the card is shown in the second scan. Five cards are shown in the second scan, but only the one card described in the title and shown in the first scan is included. Match the PSA serial number of the card in the first scan to that in the second scan to determine which back corresponds to the card listed. Great card! Selling vintage and modern Sports cards both graded and ungraded, opened and unopened. Selling autographs too. All autographs are authenticated by reputable authenticators PSA/DNA Baseball, Football, Basketball, Hockey, Non sport Card Cards, sets, boxes, singles, collections Graded cards are mainly PSA and SGC FREE SHIPPING BUYING baseball football basketball hockey non sport card collections . I do buy!! Contact me.